Updated: Monday, 1:06 p.m. | Posted: Sunday, 9 p.m. The footage shows Officers Justin Schmidt and Ryan Kelly in their squad, driving and looking for a man in a tank top who was reported to be shooting a handgun in the air. They appear to spot a man matching the description. One officer says he sees a gun and both begin pursuing Blevins on foot, down the street and into a north Minneapolis alley. "Stop or I'll shoot," one of the officers yells as they pursue Blevins. Blevins at one point appears to respond, "Why?" When an officer yells at Blevins that he sees Blevins has a gun, Blevins appears to reply "I don't." He continues to run as Schmidt orders him to drop his gun. 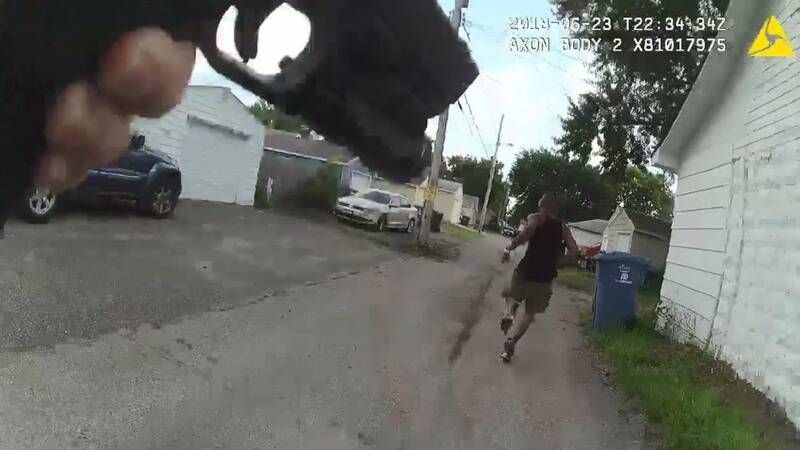 An enhanced video released by the city appears to show a gun in Blevins' hand when officers open fire. After Blevins has been shot, the footage shows officers kick what appears to be a gun away from his body. About 40 seconds elapse between the time the officers report seeing a gun, and when the shots are fired. The video above is a combination of the two raw police body camera videos released Sunday showing the confrontation between Thurman Blevins, 31, and two Minneapolis police officers who fatally shot him in North Minneapolis five weeks ago. MPR News added captions to the video. The two raw videos and an enhanced version is available on the City of Minneapolis website. The videos are extremely graphic; links to the raw videos are available on the city of Minneapolis website. Minneapolis Mayor Jacob Frey issued a news release stating the footage — raw video from the two officers' body cameras, as well as a "stabilized and analyzed" video using footage from both cameras — was being released "in the interest of full transparency." Frey's office said the stabilized video was produced by the National Center for Audio & Video Forensics in Beverly Hills, Calif., "as contracted by the Minnesota Bureau of Criminal Apprehension, and provided to the city of Minneapolis by the Hennepin County Attorney's Office." In a news conference Sunday night held shortly after the video was posted, Frey said he first saw the raw footage of one officer's body camera footage on the night of the shooting and watched the stabilized analysis of the footage for the first time on Sunday afternoon. He said Blevins' family watched the videos Sunday, but that he wasn't with them at the time. Frey said he released the video in the interest of transparency, but that he realizes it's just one step in that direction. He said people interested in solutions can neither demonize police or reject the idea that black lives matter. "Justice must be delivered to those who have historically been denied it," Frey said. "And the men and women of the MPD wear the uniform they do and accept the risks they do because they want to make Minneapolis a better place." "We need the truth to be revealed that Ryan Kelly and Justin Schmidt were never afraid of Thurman Blevins, because if they were they would have de-escalated the situation the minute they approached him," Brown said. The Minneapolis Police Department released a statement Sunday night saying that "as this case still remains an active criminal investigation, the Minneapolis Police Department is unable to publicly comment on any facet of this incident. While Chief (Medaria) Arradondo is currently prohibited by data practice law from commenting on the specifics of this case, he will continue to remain engaged, active and listen throughout the community. "After completion of the criminal and internal investigation, Chief Arradondo will be able to speak about the case." This is a developing story. As with any developing event, information may change. MPR News is working to gather information and verify facts and will continue to update this article. Correction (July 30, 2018): Sydnee Brown's name was misspelled in an earlier version of this article.